...for the "write" thing to say! 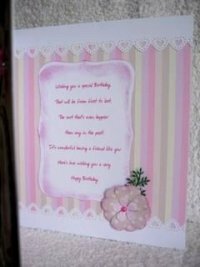 Card Making Verses that can make your recipient smile are not something that springs to every bodies mind or even where to find them. And not everybody has the ability to string words together to create their own verse either. But when the card is nearing completion it needs that finishing touch. Perhaps you just like to decorate the inside of your card to match the front or maybe you want a verse. Maybe your creation is for a special birthday, a wedding anniversary a new arrival or Valentines Day and you ant to say something personal. There are many websites that will supply you with these Card Making Verses and all you need to do is print them off onto some pretty paper and add them to your designs. There are also books where you can find all the verses and poems you could ever need. But the internet is your friend. Every occasion is covered and many of the websites provide you with the verses, poems and sayings for free , and there are thousands of them for you to choose from. Once you have chosen the one you want then you can print it off onto your chosen pretty paper, or why not try vellum for a luxury look, and make the insert for your card. Use a fancy edged paper trimmer or scissors to add some decoration to it. Or print it off onto some cream or white pearlised paper and watch the recipient smile. You have made a beautiful card and now you need to finish them off with some beautiful card making verses. and a contact number if you sell your cards.